Tagged with Business schools, GMAC, Kaplan Test Survey. Almost a third of business schools across the US have identified the domestic political climate as the top reason for the recent slump in applications, while 74% have said they are concerned it will impact international student enrolment in the years to come, a new Kaplan Test Prep survey has revealed. According to the survey of admissions officers at more than 150 business schools in the US, 31% put the significant drop in applicants down to international students seeking business school options elsewhere due to political climate concerns. Some 30% of those surveyed said it’s because the strong job market is keeping prospective students in the workforce, while another 17% said it’s due to the cost of an MBA education. 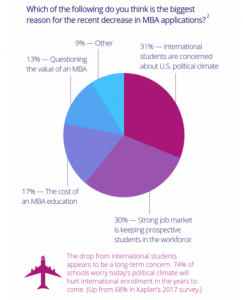 Lingering questions about the value of the degree (13%), a lack of one-year MBA programs (7%) and a perception that fewer jobs require an MBA than in years past (3%) were some of the other suggested reasons for the decline. But for the majority of schools in the survey (74%), the drop in applications from international students – who make up a significant share of the overall population at many – does appear to be a longer-term concern. This is up from the 68% who raised similar concerns in Kaplan’s 2017 survey. Commenting on the findings, executive director of admissions programs at Kaplan Test Prep Jeff Thomas said there is no question that business schools are facing some significant headwinds that are largely out of their control when it comes to the recruitment of international students. But, he added, trends in MBA applications are almost always cyclical. “When the job market is soft, you see an increase in applicants, as prospective students see the value in becoming more marketable and waiting out a weak economy,” Thomas said. “When the job market is robust, as it has been for the past two years, applications tend to be down.